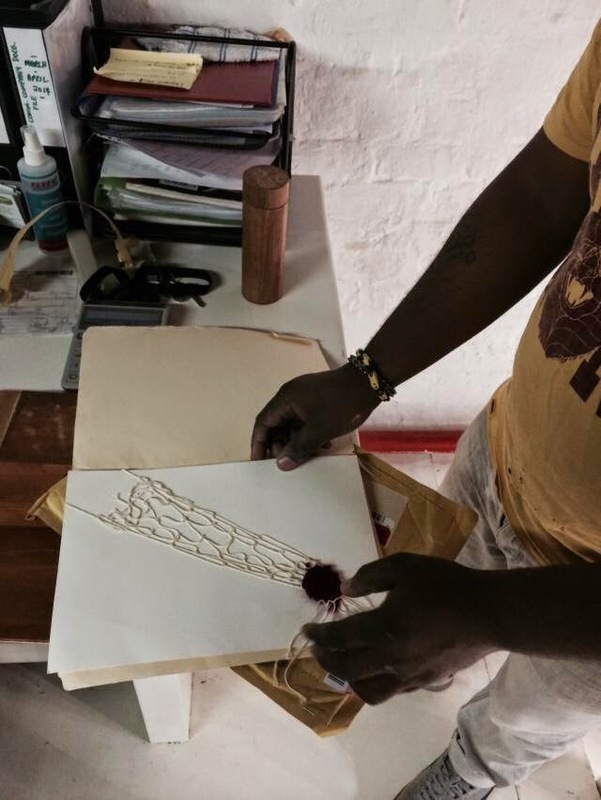 16 artists in 16 countries collaborating by post. Each artist started a piece of work, sent it to a second artist to work on, who sent it to a third artist to finish. Each artist participated in three pieces of work. After the opening show in LA, The Airmail Project is now in Beirut. 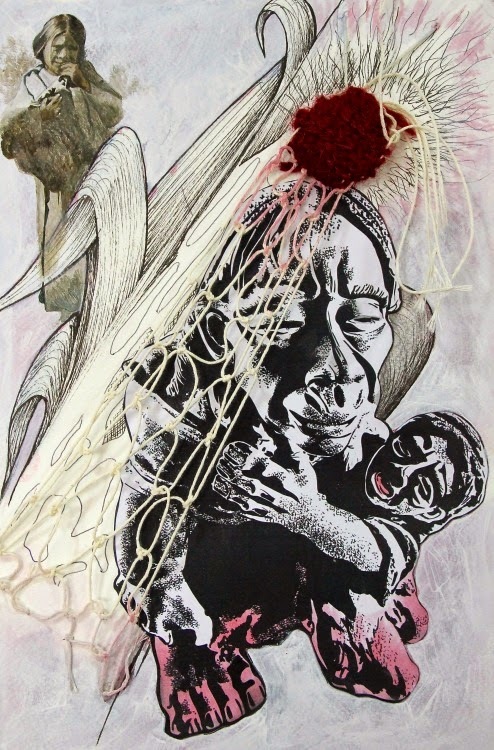 This is a guest post by Saba Sadr - the Lebanon-based artist. 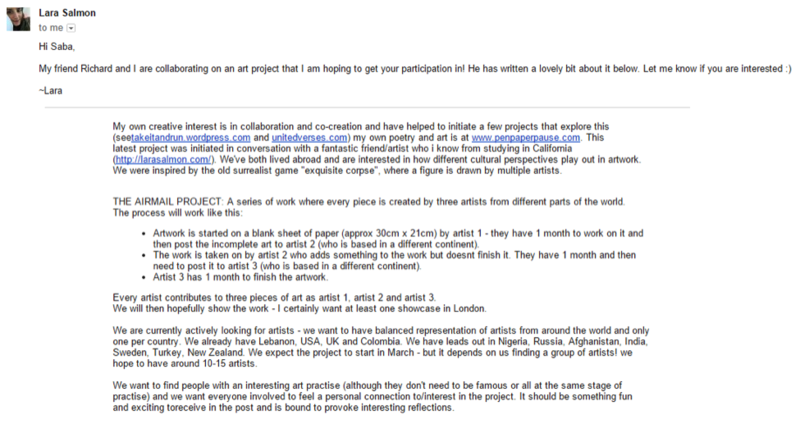 A year ago, Lara Salmon emailed me about joining the Airmail Project. We met in 2005 during our first year in AUB’s Studio Arts program, and as luck would have it, we both lived in Los Angeles and flew in that year to Beirut. Since our last collaboration, the chance at collaborating again was a happy surprise. I primarily saw this as a chance to make something outside of my Studio Arts program, but in the end I was hooked to the idea of working with other artists on more than one artwork. What better way to start things off than in the style of an “exquisite corpse”? The Airmail Project is an example of what artists can create together through long-distance postage. Each artist had to start a piece, then send it a second artist to work on it, who then sent it to the third and final artist to complete the piece, and then send it back to Los Angeles. As a result, there are 16 pieces in total, 15 of which made it to the shows in LA and Beirut, and one of which to this day is stuck in customs. Richard was excited, for the longest time, about receiving packages with personalized notes, holding an item that is given to us for a short while and belongs not just to one of us. These works highlight the conversation between the artists by showcasing the solutions each artist reached in contributing. 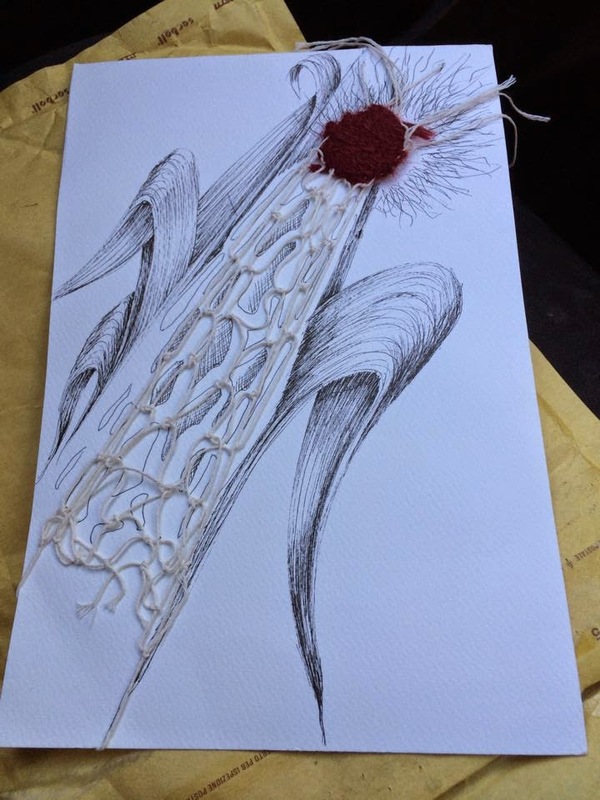 In CORN ANGEL (below), Andile Dyalvane answers my initiation of the piece with a drawing of a corn stock – the kernels are set behind the cotton net and the corn silk are extensions of the bundle of burgundy wool. Federico Fernández Gärtner adds his highly detailed figures, with the painting of a little girl at the top-right corner and the more-prominent figure holding a child. 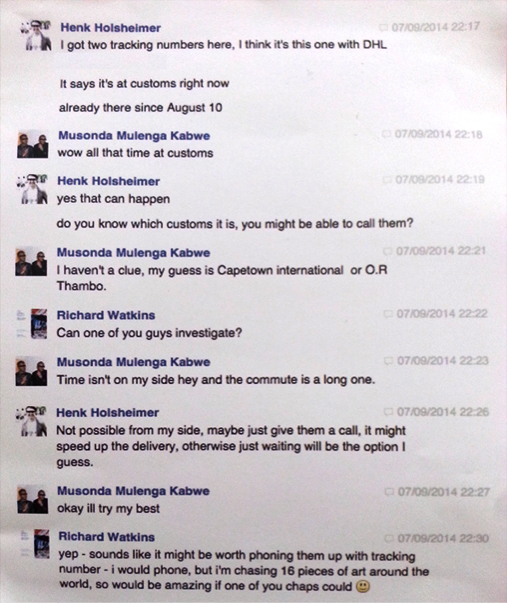 sent to Andile from South Africa. sent to Fede from Colombia. finished by Fede from Colombia. The stages of contributions cultivated a series of imagery that are so earthy and humane – far beyond anything I anticipated with the initial woven cotton and wool.While I can’t describe in detail the stages of every work, there is always a basic narrative to the stages – the first, second and third artist had to do something with their piece within the given time before sending them to Los Angeles. Many of us went beyond this narrative, and added something very personal and intense to the piece. Many of us faced different challenges of meeting the requirements of the narrative, and had trouble meeting the deadline or lost the parcel before the first show in LA (still stuck in customs, the piece titled Sleeping was missed throughout its 1st and 2nd show). But the artwork made it this far! After passing through several places, a fish in sea’s COMMUNITY space is the current place displaying the pieces. The people here helped relentlessly with arranging the show, designing the poster, and putting word out for others to see what this project and these international pieces have to offer. For free (considering the mileage on these pieces and the collection of stamps we have gathered, “free” is a much desired word to come across). In the future, we might hear about the next two shows happening abroad and with them the start of a similar localized project. Will our own Lebanese-to-Regional Airmail Project take off some day? I invite everyone to help initiate this project here. With the same process, the same narrative to follow, anyone practicing and/or specializing in art – painting, illustration, sculpture, silkscreen, etching, calligraphy, tattoo, photography – and writing can participate! Conversations through artwork between artists are short-lived, if it is practiced at all. This way, I think we can be a part of a globalized effort to celebrate each other as artists. For further information and discussion on initiating a local-to-regional Airmail Project, please contact me at 03901269, or email me at saba.alsadr@gmail.com. 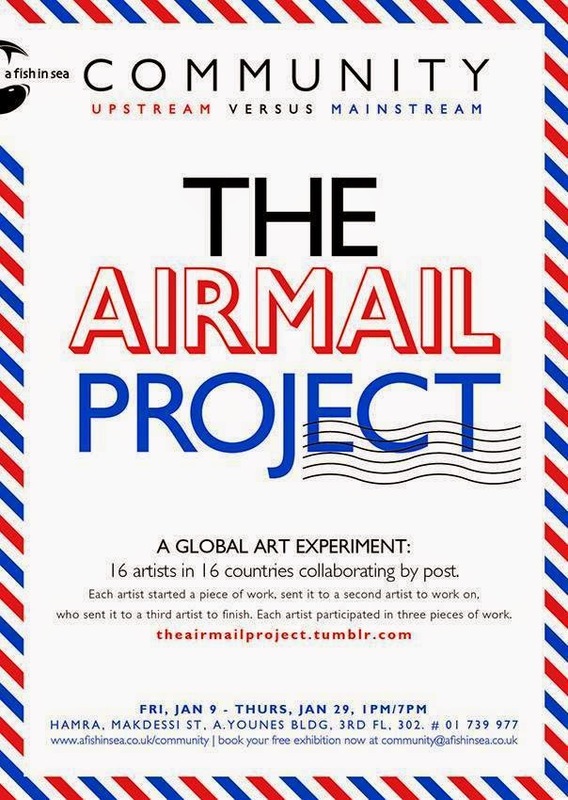 To view all works from The Airmail Project and to find out more about the participating international artists and its beginnings, click here. Read more about the show in Los Angeles here. About the author: Saba Sadr is an artist living in Beirut who works in community-based art projects. Her work is available for display on her blog pages at intraweaving.wordpress.com and outerweavings.wordpress.com.